Rajasthan also known as the Land of Rajputs is noted across the globe for its art, crafts, culture, palace and forts. The Rajputs always gave due respect and regards for all the artists from different fields and also placed them in high position in their courts. This stands as a main reason of why many arts had its roots here and developed to a great extent. The ancient history of Rajasthan demands the advocacy and patronage to all the great art forms of the state. All these ancient art works has been given a beautiful blend of touch with modern designs which includes number of craft work like marble crafts, stone inlay artifacts, silver furniture and wood crafts. One of the most pleasing and appealing work that comes from the stores of Rajasthan is the marble inlay work done on marbles. The marble inlay work is a highly preserved traditional art and today only few expert exponents are available here. This art work done on marble is mainly carried out in two places in India namely Rajasthan and Agra in Uttar Pradesh where the former is noted for its inlay work on table tops, flooring, and wall decorative and the latter is known for its Parchin Kari work. The Parchin Kari art involves very minute and precise inlay work and is quite expensive and very graceful with intricate labor. Among the various stone arts that flourished in the country the most famous one was the inlay or the crafting work done with marble stones. This craft flourished and reached its peak during the era of the Mughals in Medieval India and especially after the construction of Taj Mahal. It is believed that initially during the early 17th century in Italy minute inlay work was done on different forms of precious stones and this was referred as Pietradura where Pietra stands for stone and dura stands for anything hard. The Italians were outstanding in this classic art and in fact held an exclusive possession over this art. This soon appeared on moveable, small objects as decorative panels, with bird and flower motifs, suitable for cabinet fronts and table tops. Thus whenever there were visitors from Italy to the royal courts of the Mughals they received this art form of marble inlay work as gifts. Most of the Mughal monuments and of course the Taj Mahal one of the Seven Wonders of the World is from the art that comes as marble inlay work. This is more of a manual work involving the delicate process of cutting and engraving marble shapes. It is usually done on predefined patterns like floral design or geometrical design already engraved on the marble and then small pieces of marble of different shades are cut delicately to fit in these grooves precisely.The engraved portions are also filled with other attractive materials like colored glasses or precious gemstones. 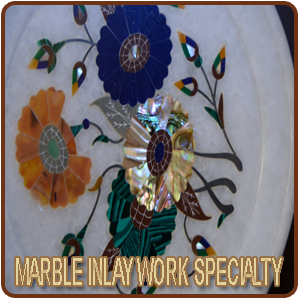 The elegant inlay work done on the marbles will surely make a person to skip a beat. India is not only a country which is rich in all types of marbles but also takes the pride of owning assets of craftsmen carrying ages of experience in the stream of marble crafts and are noted for their excellent skills. Rajasthan and Agra are two most important centers for marble carving and marble inlay work. Some of the other places noted for this art are Vrindavan, Mathura, Jaipur, Udaipur and Bikaner which are very famous for the complicated jali work on marble. Agra especially concentrates in miniature Taj Carvings, trinket boxes, vases and lamps. Most of the Mughal monuments and of course the Taj Mahal one of the Seven Wonders of the World stand as pioneers in the field of marble work. Lot of floral designs and geometric patterns involving very elaborate and intricate work are engraved on the marble stones. The marble inlaying process is quite laborious and requires lot of tolerance and perfection in the work. Though the work is very laborious it is at the same time highly rewarding. Rajasthan is known for its finished products which mostly come as alluring and beautiful tabletops. The tabletops are available both in white and green marble mostly inlaid and worked with semi precious stones like Lapis lazuli, Malachite, Jasper and Cornelia. They take up different geometric shapes including octagonal in varying sizes. There are nearly 30 types of colored stones present in the market for the inlay process and some of them are White Jasper, Chocolate Stone, Green Marble, Sang-a- Mariam, Tiger Stone, Red Jasper, Lapis, Green Aventurine, Brown Bidasar, Black Onyx, Yellow Aventurine, Green Bidasar, Yellow Bidasar, Cobra Stone, Malachite, Ruby, Jaiselmer Red (Heated), Dark Green Bidasar, Creama Marble, Jaiselmer Yellow, Alikantak, Green Laventure, Torques (Firoza), Amethyst, etc. Some stones have the property of taking heat treatment which results in giving shading effect like the yellow Jaisalmer stone wich when heated results in red color. The black Kuddaph or the sandstone is also sometimes used in this process which gives a very attractive look. Though the marble inlay work of India is similar to that of the pietra dura of Italy, the former varies by not having a three dimensional structure and are more flat. The pietra dura had more of European birds inlay work whereas the Mughals had more of Indian kingfisher, myna, and red-breasted parakeet. The present day craftsman are all believed to be the descendants of those who came from Persia to decorate the Taj Mahal, and who excelled in fine art of setting gems and semiprecious stones in marble.Most of these craftsmen or the master artisans chose Agra as their home for they realized that it was a fine art of setting gems and semiprecious stones in marble. Since then this art grew to a great extent and became an integral part of the cultural heritage of India. The descendants use the same process involved in the building of Taj Mahal, with'secret recipe" glue that has been handed down through the generations. However the fall of the Mughals also paved for the decline of the art of the marble inlay work which also led to the diminish of the craftsmen. But however the industry has regained its strength to produce excellent marble inlaid work. Latest water jet cutting technology is used to get intricate and detailed work. Technology has improved to a great extent even in this field for there are experts who can produce marble inlay work to CAD or printed drawings, or even hand sketches to produce fantastic results. The century old marble inlay art requires both semi precious stones and decorative tones and different color marbles are cut as per design and inlaid into a base stone to achieve the desired motif. There are different varieties and varying qualities of stones with beautiful colors and textures which are further categorized as precious, semiprecious and decorative colored stones. Some of the semiprecious stones include Lapiz lazuli, malachite, soda-lite, amethyst, tiger eye and white and green marbles which are used as decorative stones. The most distinguished material used in the inlay work is the mother of pearl. First the artist or the craftsman involved in the work draws a perfect sketch of the required design or pattern. Selection of the colorful decorative and semiprecious stones as per the design and requirement is selected from the available wide range. Then the decorative and the semi precious stones which are going to be used in the inlay work are sliced and usually the thickness of the stone slices ranges between 4 - 7 mm. It is then cut according to the required shape and size. Then all these pieces of the crafted stone are brought together on the base stone and then the base stone is marked with care for further process of engraving. Once the base stone is ready the different slices of the colored stones are fixed on the appropriate engraved stone with the help of special glues meant for this purpose. Then the entire work including the surface and the edges are finally polished and then buffed up to give a glossy and gleaming rich look. Synthetic stones are very rarely used for there is more liking for only natural stones. This art of marble inlay is done on a wide range of products like marble and semiprecious stone inlaid tabletops, marble inlaid bench and sofa, marble inlay vanity tops, counter tops and marble inlay flooring. More intricate products worked by the artisans include marble inlaid pillars and columns, marble inlaid fireplace and marble inlaid flower vase. 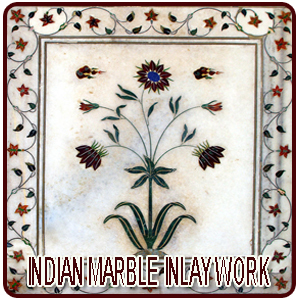 Antique marble inlay art is seen in various monuments of India like Taj Mahal and Tomb of Amir Khusro in India. Most of the marble inlaid art is mainly done by the craftsmen who are family artisans for generations.The most interesting fact about this art is that even now the artisans use the same kind of tools as used in the 16th and 17th century for this work. Also using the same sort of stones, which are not only genuine but they give real look of the past era. Also it takes more than a day to create a small flower in semi precious stone. 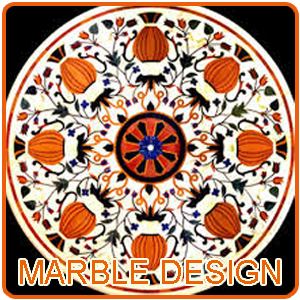 There is a lot of demand for the marble inlay products both in the domestic and western countries like USA and Europe. One of the leading unit in Rajasthan which has been doing extremely good in the field of marble inlay is the Marble cottage which was established in 1975 by Mohammad Mubin who was a descendant of Persians artists in Taj Mahal during the 16th century. Marble Cottage has came up with many innovative ideas. They have studied the interest of the present day requirements and are specialized in different trendy products like Plates, Boxes, Trays, Coaster-sets, Chess Boards, Backgammon Boards, Vases, Wine cups, Card/Pen holders, Photo Frames, Marble Inlay Medallion, Tiles, Inlaid floor, Console Table, Kitchen Counters, Statues, Animal figures, Fire places, Tomb-Stones, Name plate, custom design, calligraphy and corporate gifts. The cost of these products varies depending upon the size and work involved in producing it. A marble inlay table top may cost anywhere between 80 US dollars which is again subjected to change depending upon the size and intricacy of work involved in it.